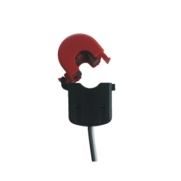 The energy meter IDPCT16A is a current transformer used for measurement of electric currents in circuits up to 16 amperes. The Snap-On system on IDPCT16A reduces significantly the installation time and allows attachment without interrupting the current-carrying wire. This sensor is used with the M2M gateway. The energy meter IDPCT80A is a current transformer used for measurement of electric currents in circuits up to 80 amperes. The Snap-On system on IDPCT80A reduces significantly the installation time and allows attachment without interrupting the current-carrying wire. The energy meter IDPCT8200A is a current transformer used for measurement of electric currents in circuits up to 200 amperes. The Snap-On system on IDPCT8200A reduces significantly the installation time and allows attachment without interrupting the current-carrying wire. The energy meter IDPCT400A is a current transformer used for measurement of electric currents in circuits up to 400 amperes. The Snap-On system on IDPCT400A reduces significantly the installation time and allows attachment without interrupting the current-carrying wire. The testo 760 Digital Multimeter detects the lead connection and prevents switching from V to A or A to V if leads are not in proper socket. This prevents accidentally blowing the meter’s fuse because of incorrect connections. It includes TRMS, dity cycle, low passfilter, and temperature measuring. Testo’s exclusive auto-test setup enables the user to simply turn on the unit, connect the leads, and begin measuring. The testo 760 Digital Multimeter detects the lead connection and prevents switching from V to A or A to V if leads are not in proper socket. This prevents accidentally blowing the meter’s fuse because of incorrect connections. It measure up to 400 A with optional clamp probe adapter and temperature. he Testo App can be used for remote viewing, monitoring trending over time, and creating reports. The powerful app allows you to create custom reports that include photos, data, and graphs that can be saved or sent via email. Unique hook-on function separates and grabs wires without using your hands and retractable post makes hook release fast and easy, Bluetooth with free Testo App for Smart Phone for remote viewing, monitoring trending over time, and creating reports, Real-time power measurements (Watts) with smultaneous power factor indication μA for flame rod and can also measure temperature using an optional Type-K thermocouple adapter. The testo 745 NCV has a built-in Low Pass Filter which greatly reduces high frequency interference which causes false indications. The built-in LED flashlight is bright and focused to make testing simple in dark spaces. It also includes a low battery indication and is waterproof and dustproof rated per IP 67. The testo 745 is rated to CAT III 1000 V and CAT IV 600 V.
Testo’s history of efficiency, innovation, and quality now extends into the entire electrical lineup. Once again, Testo brings high value, feature-packed products to the HVAC contractor market.